Bought this car near-new with 5000 miles on the clock, I've driven it for a year and have done 8000 miles, at first I was disappointed with it's unengaging and unrewarding ride and handling, and the seemingly minimal torque of the hybrid system. But as the year has gone by it's won me over - the car's many virtues have just taken a while to appreciate. It is extremely well put together, there are absolutely no creaks or rattles and the doors shut with a very satisfying thwack, the hybrid drive is brilliant, the Excel grade I chose provides heaps and heaps of kit, and the car looks smart but unshowy, I like being able to park it anywhere without it drawing any attention. Yes, the CVT whines when under hard acceleration, but for me that's about 2% of the time, during the other 98% it's quiet and smooth, no discontinuities from any kind of stepped gearbox, just near-seamless changes from EV to engine drive. Overall the car returns 57 mpg (this figure obtained by keeping records of miles done and litres put in, please be aware that other owners may be reporting consumption figures that show on the trip computer readout, I find this to be overall about 4 mpg too optimistic). My lowest fill up mpg has been 52, my highest 62. I find the car most economical on long runs. I get a range of at least 500 miles, the low fuel warning light comes on after about 430 miles but you can still drive quite a fair distance after this - the tank holds 45 litres, but I've never put in more than 39 litres to brim it. 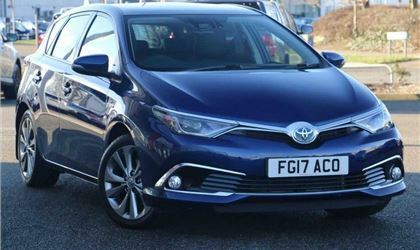 I thought very seriously about a Prius, but in the end chose the Auris because it's a lot cheaper, you sit a bit higher in it, and I think it has less risk of grounding when going over speed bumps, and it's looks are far less shouty. The Auris also has the option of the full length non-opening (therefore no leaks, no rattles, no rust) sunroof which I went for and really like, particularly at dawn and dusk, you can't get this on the Prius. Finally, the Auris has a CD PLAYER!! This may not matter to some, but I own 1000s of CDs and so it was a must-have, sadly, the universal trend is to omit this device (it's not in the Yaris, the CH-R, the new RAV4, or the forthcoming Corolla).